Five years ago, I read The Wednesday Wars. I read it because Janssen highly recommended it, and I like almost everything she recommends. But it was a bit of a disappointment--maybe because I had too high of expectations or maybe because the characters and/or plot just didn't excite me. I don't know, but basically, I didn't love it. It was fine. Yes, it was definitely fine, but I didn't find anything in it to say, "This is the best middle-grade book ever." I returned it to the library and went on my merry way. It was one of those books that seemed like it would fade quickly from memory so that, three months later, when someone asked, "Have you read The Wednesday Wars?" I would say, "Um . . . yes. I think so? I can't remember a thing about it though." But even though this was no more than an average book for me, it wouldn't let go, mainly because it kept popping up with more rave reviews, and each one irked me more and more because I would think, "Why does everyone love this book but me?" So for the last five years, I've had this annoying little fly of a book that wouldn't leave me alone. And finally this year, after seeing yet another trusted friend gush about it, I said to myself, "Fine! Fine! I'll read it again!" I changed format this time and went with the audio instead of the paper copy. And whether it was the change in format or the span of five years or that I knew bits and pieces of the story going in or just that I was determined to like it more, it was a completely different experience. And when I say different, I mean it was truly fantastic. When the story begins, Holling Hoodhood is beginning seventh grade. Besides the normal seventh grade worries (i.e., eighth graders), Holling has other problems, such as that his teacher, Mrs. Baker, hates his guts. Every Wednesday afternoon, all the kids in his class leave for religious instruction, except for him because he's the only Presbyterian in the bunch. That means that he and Mrs. Baker spend that time alone. At first, she fills the time by having him do odd jobs around the classroom, but after a month of that, she decides they could make better use of the time by studying Shakespeare's plays. At first, Holling balks at the idea, but midway through The Tempest, he decides that anyone who can curse as impressively as Caliban is worth reading more of. Since it's been five years since I read it for the first time, I can't say for certain that listening to it made me like it more . . . but it seems very probable that this is the case. Joel Johnstone made this bunch of 7th graders come alive for me: his voice cracked in all the right places, and when Holling talked about cream puffs, he sounded as ecstatic as only a thirteen-year-old boy could sound. But this story never became about the parental neglect (or the bullying--seriously, where were the teachers when Danny got shoved down by the eighth graders during the race?! ), and I really loved that even though the issues were there (and they definitely made the whole story feel more authentic), they never became the focus (which sometimes happens in middle grade novels). This story wasn't about abuse or bullies or first-love: it was just about Holling. All of those things just played a part in telling a more complete story. Aside from Holling, Mrs. Baker was definitely my favorite character (as I think she was intended to be). I spent a good chunk of the book just trying to figure her out. She was austere and strict but also so incredibly kind (especially when it really counted). She was also very wise. I spent the entire time trying to figure out what her age might be. At the beginning, I was pretty sure she was in her fifties. She just seemed to have lost all sense of youthful energy and fun. But by the end, I realized that was due in large part to the stress of having her husband away at war, and so I became convinced she was in her late twenties, or at the very oldest, her early thirties. I also enjoyed Gary Schmidt's writing style a great deal more this time around. The first time, it was average. This time, it was stellar. This may have been my favorite paragraph in the entire book: "Think of the gladdest sounds you know: the sound of dawn on the first day of spring; the sound of a bottle of coke opening; the sound of a crowd cheering in your ears because you're coming down to the last part of a race and you're ahead; think of the sound of water over stones in a cold stream and the sound of wind through green trees on a late May afternoon in Central Park; think of the sound of a bus coming into the station carrying someone you love. Then, put all those together, and they would be nothing compared to . . ." And I don't want to finish the sentence for fear of spoiling the best part of the book for anyone, but just know that something really wonderful was happening right then. As I read this book, I couldn't help but compare it to what is possibly my favorite middle-grade novel, Navigating Early. For some reason, that book clicked instantly for me. And even with as much as I loved The Wednesday Wars this time, it still can't even compare with how much I love Navigating Early. Recognizing my feelings for that book is helping me understand people's adoration for this one. It's not that one is better than the other. It's that readers are different, and we connect with different books in different ways. That's the magic of reading right there. 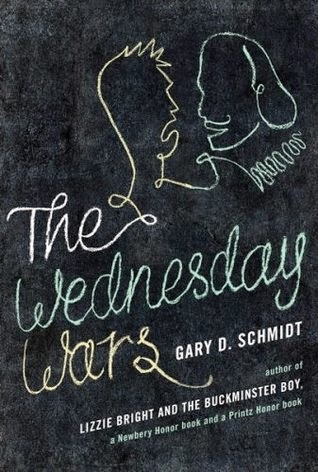 You might feel that connection with The Wednesday Wars or with Navigating Early or with another book entirely. But I guarantee you that there's a perfect book out there for you--one that will make you want to sweep the characters into a big gigantic hug and say, "I'm so glad I found you." Tell me, what's that book for you? I love that you came back to this one and had such a different experience with it! I passed over this one when we read it in book group. Now thanks to your post, I think I better give another try. I haven't read it, but I am loving that book's cover art. I'm so so glad you read it again. One of my all-time favorites, as you know. I liked Navigating Early, but I liked Moon Over Manifest quite a bit more. It's just so interesting how different every book is for every reader.